Would Google ever drop the 'www' from their lead URLs? We should see Google moving over the m. sub-domain for mobile. Check out this jobs page from Google UK. 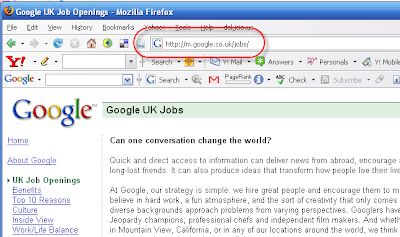 An interesting quirk is the w.google.co.uk/jobs address. On Google UK you can view the same page. Over at Google US if you try swapping out the .co.uk with .com then you'll trigger a redirect. Could we see m.google for all mobile content on Google and w.google for web content on Google? Maybe. By the way, if you are interested in at job at Google UK then you'll be pleased to know that their Belgrave House offices are spacious and comfortable. They're just around the corner from Victoria Station and the tube. If you're keen on mobile search then Belgrave House is the place to be too.